Instructor Antti Nurmi has honed his expertise in various international gyms. He's a multitalented and energetic trainer, whose instruction lacks neither power or technique. Antti has almost 20 years of experience in martial arts and a 10-year intensive relationship with functional training. His martial arts experience dates back into the '90s. He's been a Krav Maga instructor for 14 years, fought in MMA, kickboxing and submission wrestling. Antti has an impressive amount of knowhow regarding functional training in Finland as well as abroad. Antti is a Defendo Blue use-of-force- and self defense instructor with responsibility in instructor training abroad. He's a professional martial arts instructor as well. He's a pioneer in kettlebell training in Finland. He's developed the IKSA/IUKL Fighter Line training method for martial arts instructors. He's a main instructor and linespecialist in kettlebell instructor training and fighter physical training in Spartan Gear. We bring you the most effective training you've ever attended – and we keep our word, but you won't believe it until you feel it! We'll go through the kettlebell basics with you with detailed explanations on why we do this the way we do. Even the most advanced exercises are taught to you so you'll be able to do them in your sleep. The learning is rewarding, a lot of fun and we won't spare the sweat. You'll learn to teach it, do it and enjoy it. When you want to offer your customers the kind of service that others are only talking about, join us. When you want to raise your own standards of personal fitness and aren't a professional instructor, you're more than welcome to join us. The extensive demand for our international courses to the end of 2013 shows you that we know what we are talking about and can walk the walk as well. Move in the cutting edge of functional training and do what others only talk about! Take the challenge and join us - it doesn't hurt, it feels good! You - Be there on time. Bring exercise equipment, low-soled shoes, a water bottle and some small snacks as well as note-taking equipment. The course is two days long, so arrange accomodation. We'll help if necessary. There will be enough breaks so we'll all keep up. 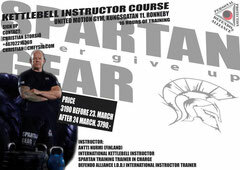 We - Arrange a first-class enviroment for learning, kettlebells and training gear. We'll also bring an awesome training and a new way to enjoy exercise. You'll also get a written instructor folder for easy reference. We also give you good deals in Spartan Gear products. Together - We will show you, instruct you and do with you, but you'll get to do a little more. You'll exercise yourself, as that is the only way to learn. We'll back the exercises with theoretical background information, as that is the only way to understand why we do as we do. Together we are stronger than alone, and you'll see what a like-minded group can accomplish in a short time! Our references come from top names in their respective arts, Finnish, European and World Champions. 18 years age and normal physical condition.